We want to have hot pot dishes (is called “nabe ryouri” in Japanese.) in the mid winter, don’t we? Kimuchi taste (based) of hot pot is one of my favorite dishes. We need to use to a certain extent of kimuchi for nabe. 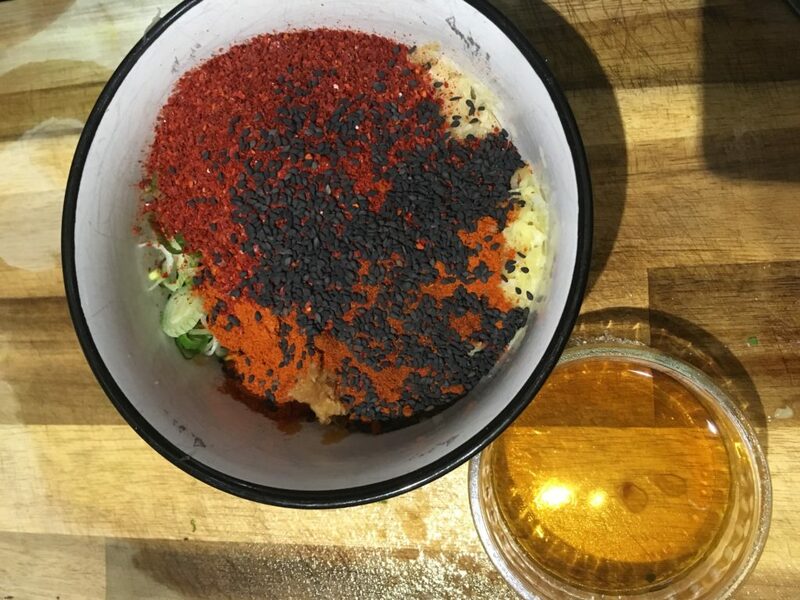 Of course we can buy a pack of kimuchi anywhere in the UK and you might be able to find more variety of kimuchi at a big asian grocery shop. However it’s expensive for me. I think average market price is￡3 for 200‐300g. I guess you might get it cheaper than that price at Asian foods shop where is in big city as London and Manchester etc.. but shops nearby I live sell above price. 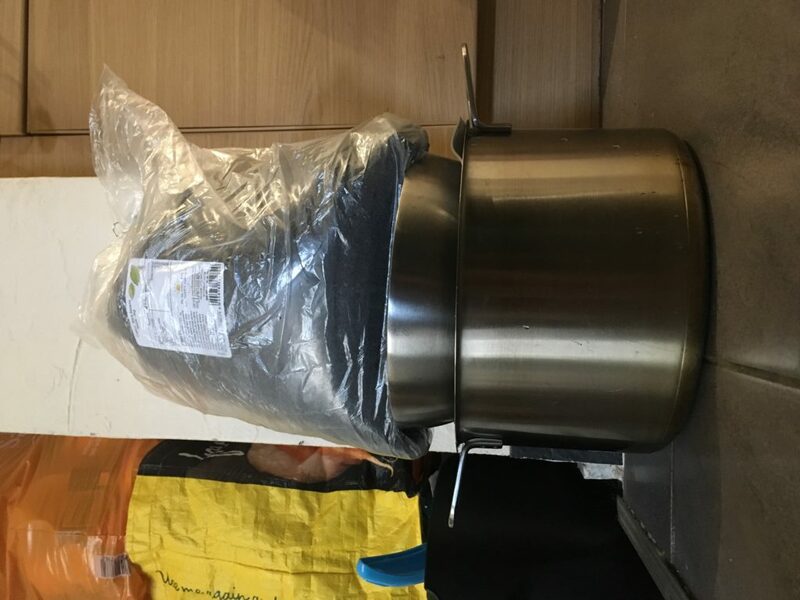 I am not happy to spend ￡3 for just only 200-300g of kimuchi because this mount is gone very easy at once so I’ve bought it several times so far since I came to the UK. 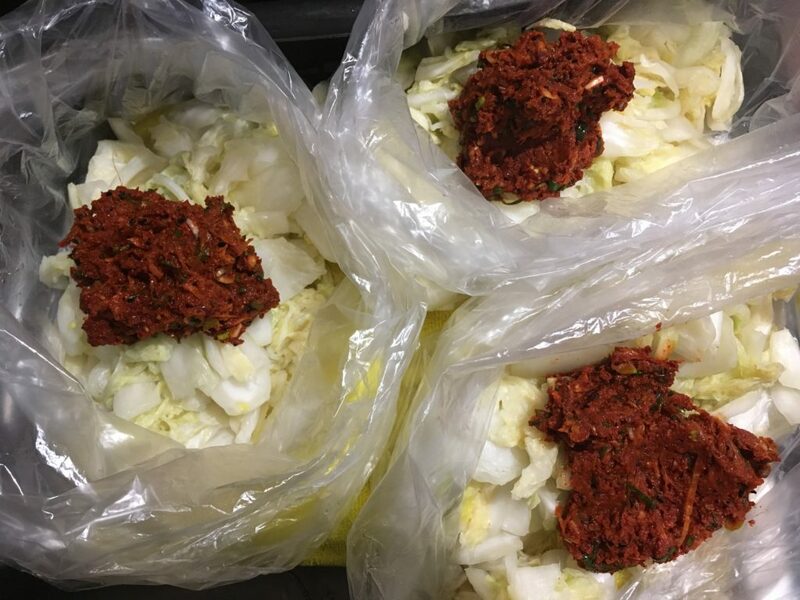 I’ve got image that making kimuchi is very hard… The birthplace of kimuchi in Korea, they normally make it at home and each family have their own recipe and different taste and also they have a fridge only for kimuchi. 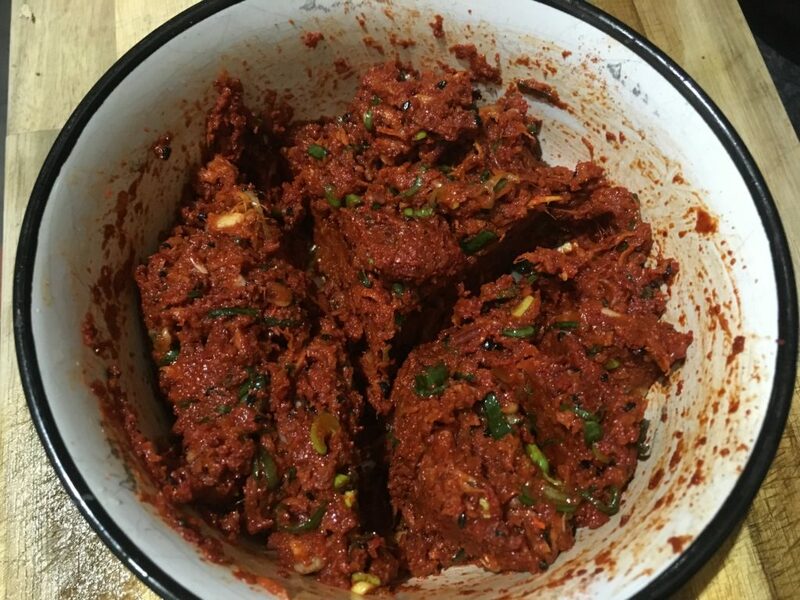 My kimuchi recipe might not be authentic but you can adjust how much spicy you want and it’s reasonable too. It might take your time but I’m sure you would like to have it always at home. Wash Chinese cabbages and take calyx out then cut 8 pieces lengthwise. 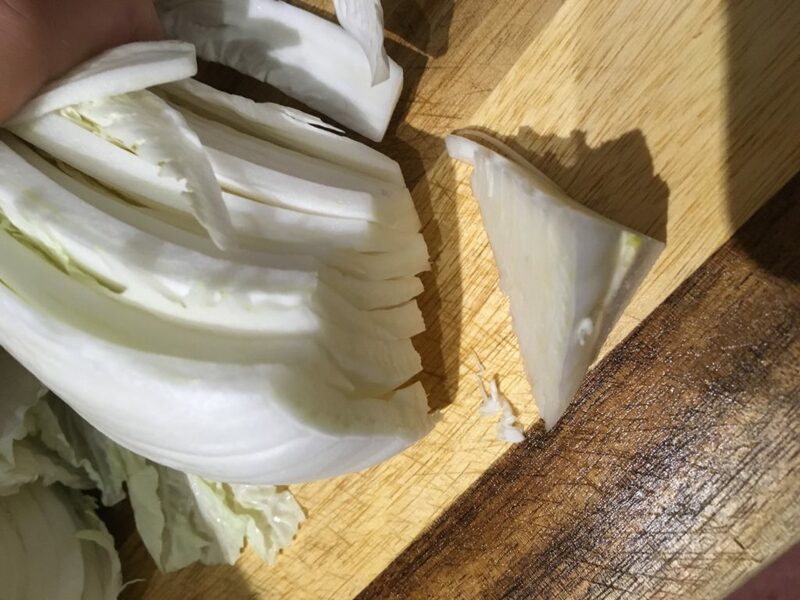 Cut about 1 bite size and divide leaves side and white part. 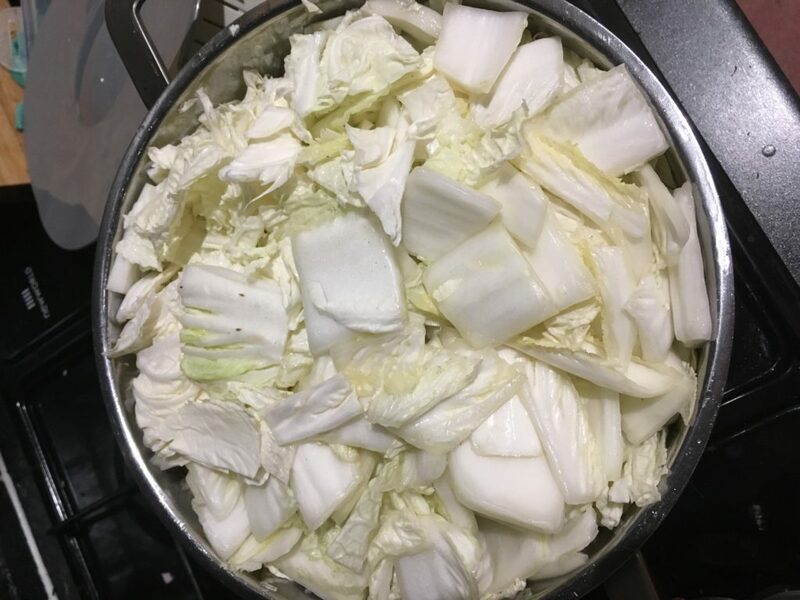 First put only ｗhite part of Chinese cabbages into a pot or bowl and add all salt and water and mix very well. I recommend to use big pot or big bowl. 30 minutes later, add all leaves into the pot and mix well as each of Chinese cabbages can get salt water. They are filled of my biggest pot. 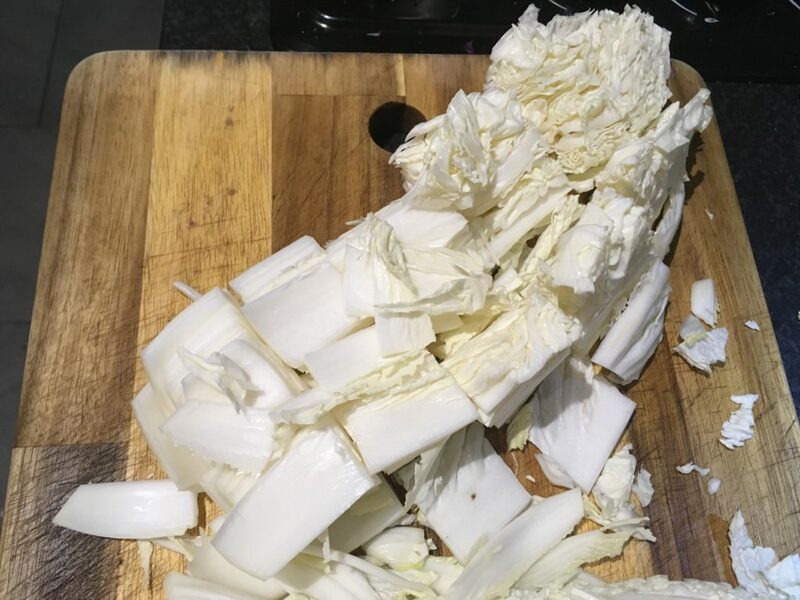 Place a plate or silicon lid on the Chinese cabbage and leave about 3 hours with weight on the plate. 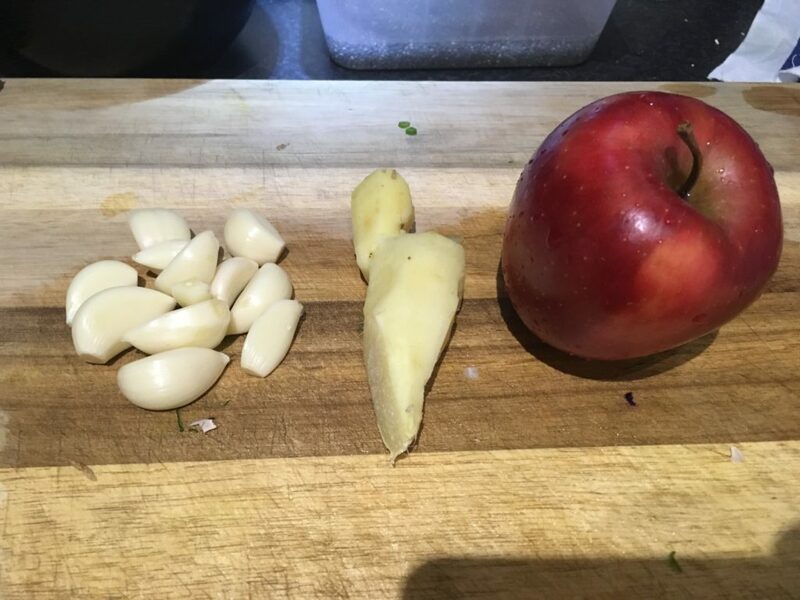 Grate an apple with skin, garlic anf ginger. If you have a food processor, that’d be good to use for. (chill flack is fine If you don’t have) into 6). 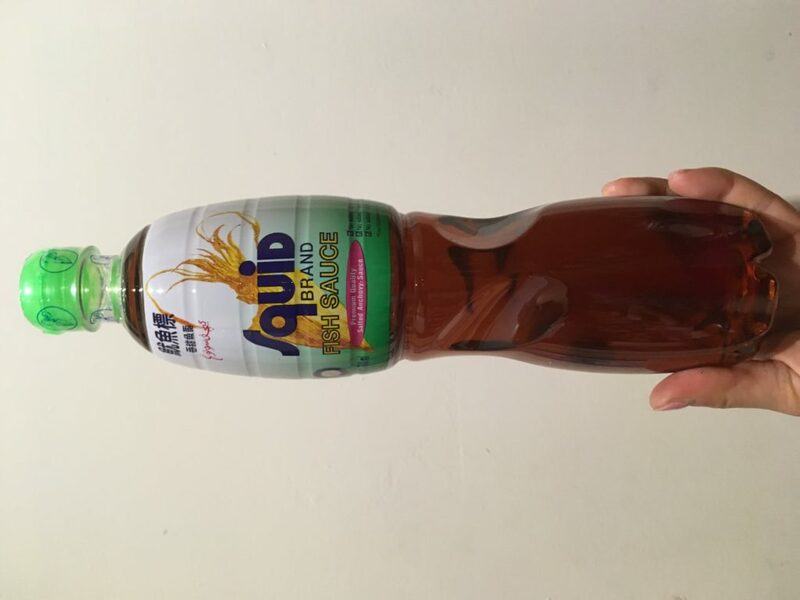 You need to adjust how much spicy you like here. Cut chinese chive as 2-3 cm and chop spring onion. Add left of all ingredient into a bowl them mix well. By hand (it’s actually traditional way) or chopsticks whatever you feel easy and comfortable to mix. 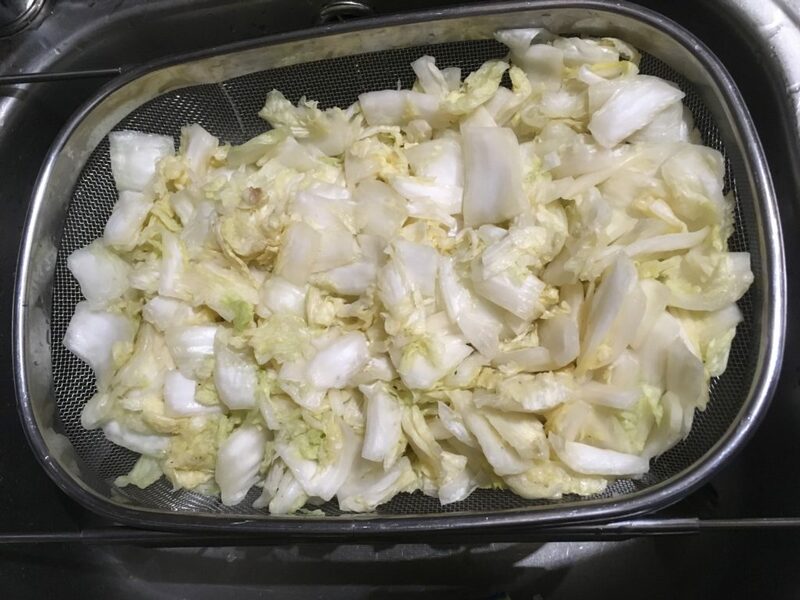 Squeeze Chinese cabbage from salt water properly, leave them in the colander and drain about 30 mins. 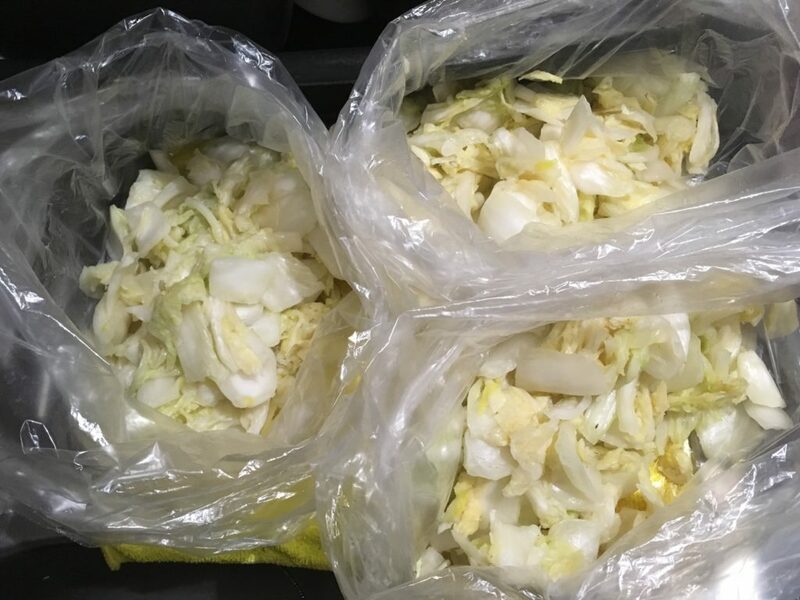 Divide Chinese cabbages into thirds and put them into plastic bags each. 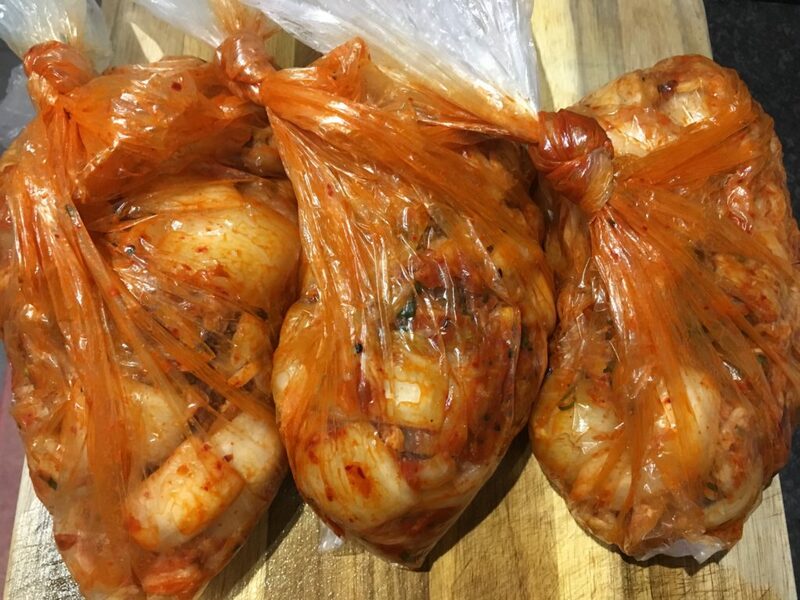 Divide yannyomu into thirds too and put them into each plastic bags them knead well. 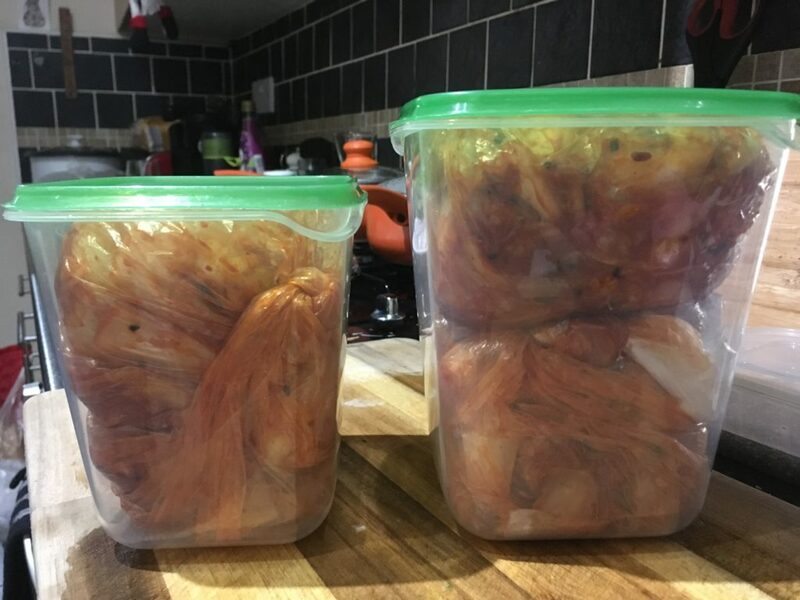 Take air out from plastic bags and tight up and place them in containers in the fridge about 4-7 days. You can eat kimuchi from next day but that’d be nice if you can wait a week! Please make sure to check how much spicy you want because this recipe is what I like. I normally LOVE spicy dishes so if you are just ok for it, I recommend to add less 5g chill powder and frakes each at least. In my way, you don’t need to use plastic gloves at all. I use spoon or chopsticks when I make yannyomu. Kimuchi hot pot, kimuchi natto (fermented soy beans), kimuchi fried rice, kimuchi udon and kimuchi pork fried etc.. now you can add kimuchi as much as you want and whenever you want eat! It might be kimuchi smell in fridge but I think it’s not strong as you really care. Kimuchi is gone very quick since I stared making that’s why I really don’t care about smell because it doesn’t long in the fridge a while. 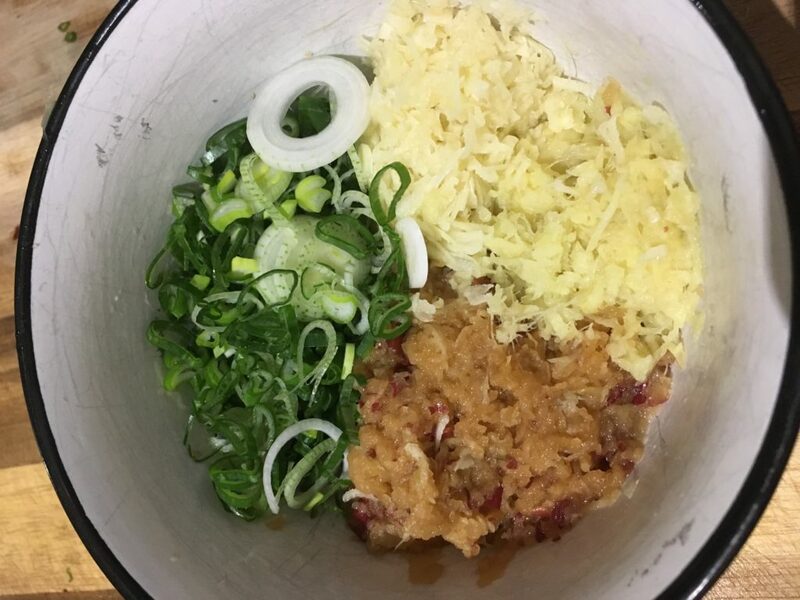 Making kimuchi is not complex as you think. Let’s make the best kimuchi you love and keep it with you always! Today’s title:Talk about Misisan what I have been. I will let you know about me more today. I was born and grow up in Tokyo. I was Heisei born. I went to high school in Tokyo and spent such an unforgettable time for 3 years. I still (of course) meet friends who I met there even all of us have different lives, some of us got married, have children and others enjoy single life but I see them whenever they have time, wherever easy to get together when I am back to Japan. Also all of friends from my home town have children but we often see each other the same as friends from high school! Awww I really miss all of them so much! After graduating high school, I went to women college and straight away started working as an office lady after graduation in Tokyo. During I was working, I tried to travel somewhere in oversea when I made time. I did 2 or 3 times a year. First, I decided to go to the Philippines to study English. I noticed that a lot of students in the same school in the Philippines were going to Australia with working holiday visa after finished studying while I stayed over. I was going to be in Japan a little bit and started preparing for travel around the world but I determined to go to Australia like them because I purely wanted to go and see Australia. I ended up to stay in Australia for 2 years, I met partner, Paul before first year expired and our second year started. I applied YMS 2015 (Youth Mobility Scheme), got this opportunity and landed the UK before Christmas. I was just super lucky that I was selected YMS in 2015. We applied a partnership visa 3 days before YMS expired and our visa application approved without problem in January 2018. I will post a blog that focus on partnership soon. Now my forth year living in the UK just stared. I never thought about living in the UK when I was willing to do “travelling around the world” and my life is a bit far from that dream I had (am having) but still it’s kind of linked “abroad”.